Nestled just 20 miles west of Austin’s bustling city lies an array of robust rolling hills, immersive greenbelts, and adrenaline-pumping recreational water activities. Once considered to be a relatively secluded area, Lake Travis has steadily risen as an attractive mainstay for new housing developments and an exceptional school district. Lake Travis serves as a viable option for those who desire to live in lush, beautiful natural surroundings while being close enough to access the many benefits of Austin’s cultural and business scene. With its lake-front restaurants, fabulous entertainment options, nationally renowned golf courses, and exclusive waterfront communities, Lake Travis offers something for everyone. Its 118.2 square miles bordered by Lake Travis to the north, the Travis and Hays county lines on the south, the Pedernales River to the west, and Lake Austin and Barton Creek to the east, offer some of the most breath-taking views of the central Texas hill country. Lake Travis itself is a hydroelectric reservoir on the Colorado River that was created through the construction of Mansfield Dam in the late 1930s. The lake is approximately 63.75 miles long, 4.5 miles across at is widest and spans 18,930 acres. Its maximum depth is 210 feet and is the primary flood control reservoir for the Highland Lakes. 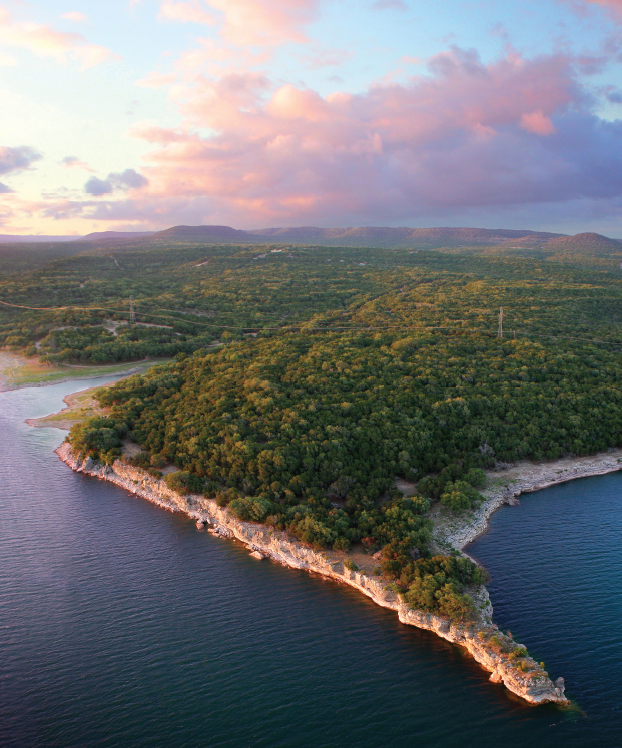 With over 270 miles of shoreline, Lake Travis is an outdoor enthusiast’s dream come true with fishing, boating, nature trails, camping, zip lining, picnicking, and outdoor dining choices. Located next to Mansfield Dam is Mansfield Dam Park which serves as the deepest and most accessible boat ramp on Lake Travis. Stunning views of Lake Travis can be seen from the west peninsula of the park, while scuba divers can partake in a day of underwater adventure. With four diving platforms around Lake Travis, divers can follow an underwater trail to see sunken boats, historical dam construction pieces, and other geological formations. A day isn’t complete without enjoying some delicious barbeque from the grills located within the shaded picnic area and going for a leisurely walk along one of the scenic nature trails. Another gorgeous park located on Lake Travis is Pace Bend Park. It features over 1,000 acres of primitive wilderness, limestone cliffs, biking and walking trails, as well as camping facilities that offer electric hook-ups, showers, and restrooms. The pristine emerald waters off of this attractive shoreline offer plenty of water fun including rafting, boating, and swimming. Lake Travis enjoys a relatively moderate temperate climate year-round. It has mild winters and takes in low humidity levels although summers can be hot. It averages 300 days of sunshine a year and has an average rainfall of 32.1”. Temperatures range from mid-70s to mid-90s in the summer and 40 to 70 degrees during the winter. The average daily temperature hovers at 78 degrees, making the lush landscape that much more enjoyable. The Oasis, located on Lake Travis, is one of the premier tourist locations along the lake to view the radiant Texas-sized sunsets reflecting off the translucent crystal waters. With an indoor and outdoor seating capacity of 2,500, this restaurant prides itself on being the largest outdoor restaurant in Texas. Sweeping views of the lake at sunset makes this 30,000 square foot dining establishment a mainstay for locals and tourists alike. Dubbing itself as “The Sunset Capital of Texas”, it’s not hard to see why this establishment, located 450 feet above the lake with extended terraces, can easily take home the prize. The Baylor Scott & White Medical Center (previously the Lakeway Regional Medical Center) prides itself on offering superior state-of-the-art medical care in a warm, hospitable and caring environment. This 274,500 square foot plush hospital offers a full-service emergency room, oversized birthing suites, a level 2 neonatal intensive unit, 106 private rooms, along with open-hours for visitation, an in-room dining program with over 50 made-to-order items, in-room trundle beds for overnight guests, and complimentary internet access. The onsite Heart Institute has the most advanced cardio-technology available coupled with highly trained cardiologists and experienced cardio-thoracic teams. Among the upscale shopping destinations that the Lake Travis area has to offer, the Hill Country Galleria in Bee Cave is in a distinctive class of its own. Complete with native trees, blooming wildflowers, and rolling streams, this unique lifestyle center is home to 152 acres of pure shopping heaven. The many delightful dining and entertaining spaces enhance the enjoyment of this modern, open-air village setting which gives way to a warm, inviting community feel. Live music and entertainment can be savored from the on-site amphitheater. Stores gladly welcome four-legged animals with water bowls and treats. The Sonesta Bee Cave hotel is located on the premises with 200 hotel guest rooms and 8,000 square feet of meeting space. Office and residential spaces within the Hill Country Galleria also add to the dynamics of this city’s gem.